Build an eLearning module for Experticity members that illustrates how white noise machines help solve bad sleep hygiene by solidifying healthy sleep habits so that they can better recommend Marpac products to customers. Set up a client kickoff with the brand. Assess what Marpac's business goals are for their eLearning campaign and what sort of engagement they want to get from our users. Brand awareness? Product seeding? Why do they need this eLearning campaign? 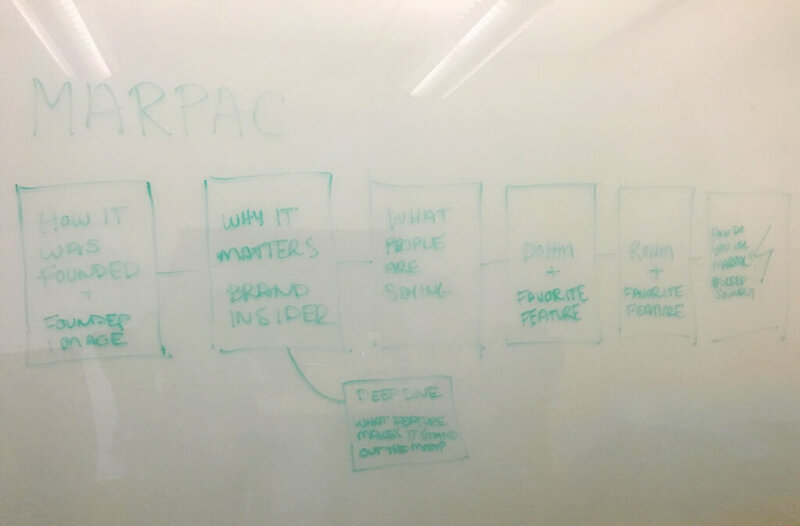 Research Marpac's brand perception. What do people think of Marpac? What are questions most people have about white noise machines? When and where do people use their white noise machines? What do people love about their Marpac machines? What do people hate about them? Is there a common thread of questions that users have about the product can be answered by the brand? What are we building? Now that we've emphasized with Marpac users, define the problem. Taking into consideration Marpac's business goals (why) as well as the market research/brand perception information we've gathered (who), brainstorm a storyline presentation alongside the Instructional Designer that balances the brand's business goals with authentic feedback from their customers. How are we going to do this? Sketch, create a flow, and wireframe critical screens based on the storyline presentation (story) we've created. Design an eLearning app that teaches users about the benefits of sleep while advocating for the Marpac Dohm white noise machine. Lesson needs to be a fun & light-hearted approach about the benefits of sleep (not the product). What data is important in making Marpac's eLearning campaign successful? Users want authentic content from real users of the product, not marketing-speak. Users need to understand the benefits of sleep and sleep's relation to their overall physical and mental health. Users need to be able to recommend the Marpac line of products to customers. Most people think they can use for app for white noise, and don’t understand the difference between digital versus organic white noise. Marpac's Dohm white noise machine helps reinforce healthy sleeping habits, which is turn promotes good health in users. Marpac is the original white noise machine and still the best, despite knock-offs because they are long-lasting. White noise apps and white noise machines are not created equal and comparing them is like comparing an mp3 to a vinyl record. Authentic feedback about the product from real-life consumers (who we will call our "sleeping experts"). Final story flow that we decided on for the Marpac lesson after iterations of the one pictured below. During this phase, the Instructional designer and I map out the structure and flow of the eLearning campaign. We reiterate what the client's engagement goals are, as well as the user needs, and draw a flow map based on that. In this case, we bulleted out the flow of the story and what needed to be included. We'll start by addressing the importance of good sleep hygiene and some statistics on the lack of sleep Americans get. Then we'll introduce the product (the Dohm) as an answer to the problem of bad sleep hygiene by having two experts from the Experticity platform try out the Dohm and keep a daily sleep journal documenting their hours of sleep, caffeine intake, and overall feelings of rested-ness after sleeping with the Dohm for one week. These sleep journal excerpts will be sprinkled throughout the lesson as a way to reinforce authentic user feedback, be it negative or positive. From there, we will address the difference between analog, organic sound created by a physical fan like the Dohm versus digital sound from a white noise app on your phone. We accomplish this by comparing it to how a vinyl record sounds versus an mp3. From there, we'll introduce the line-up of Marpac products: Wishh, Hushh, and the Dohm Elite, spending a brief amount on each product and focusing on the key features/use cases (i.e. the Rohm traveling, and the Hushh for babies, etc.). We will wrap up the entire lesson by reiterating the importance of good sleep hygiene, and how Marpac products help to reinforce healthy sleep habits. Initial whiteboard brainstorm story flow map that we decided not to use and replaced with the bulleted list above. Now that our initial storyline has been created, we present our ideas to the client and gather feedback. Once the storyline is approved, the script for the lesson is created by the Instructional Designer and then handed to me to begin wireframing and prototyping. I start by taking the script that the Instructional Designer has written and begin to break it out into sections visually. Quick sketches of the story flow with interactions and possible visuals. Now that my wireframes are done and I have a basic idea of how I'm going to lay out the information/interactions in the lesson, I open Sketch and begin to create high-fidelity graphics. From there I begin to create the look and feel of the sleep journal excerpts from our experts. Because I know this is an important part of the lesson, I know that I need to emphasize them, so I code a scroll animation and pulls them into the center of the page as the user is scrolling. Animated gif of the sleep journal graphics being animated into the page as the user scrolls. Now that I have my biggest interactions coded, I focus on designing and coding the rest of the module, making sure to emphasis big, bold graphics that are in line with the brand's guidelines. Screenshot of part of the Marpac eLearning module. Positive. Client was very happy with design and content and had minimal revisions. Campaign launched on time and was met with increased engagement from our users. We didn't get a very long study of the Rohm's effect on our expert users (1 week). Ideally, next time I would like to have a longer time period so that we can collect more robust answers and feedback. Nonetheless the information we were able to collect was useful in creating this module and definitely contributed to the authentic, real world feedback goal that we were striving for. Allow more time for longer studies of the Dohm's effect on user's sleep. A/B test a user-feedback module versus a product-focused module and see which one results in more product sales for the brand.